The cheapest, easiest way to clean your stove… Part 2. 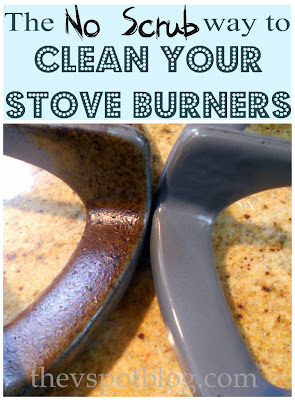 As a crafty, creative person I think it’s a little amusing that one of my most popular posts is how to clean stove burners using ammonia and ziploc bags. Anyhow, I have gotten repeated questions about whether or not the ammonia trick would work on the stove top drip pans too. Because I kept having to answer I don’t know, (and because my drip pans were deeees-gusting) I thought I’d give it a try. As you can see, they have that disgusting, greasy gunk on them that just smears around but never actually comes off. Take off the burner and the little deal-y in the middle and pour just a few tablespoons of ammonia onto the drip pan. You don’t need to measure it, just eyeball it. Cover tightly with a piece of plastic wrap or Press’n Seal (which I think works best.) Let it sit overnight. When the plastic is removed, the ammonia fumes should have done their job, which is to dissolve the grease and gunk. Remember, it’s the fumes, not the ammonia itself… that’s why you need to seal up the area with the press and seal. For the most part, the drip pans wiped clean. There were a few spots that were still there, and I think that might be simply because I needed to leave it to sit a little longer, but I needed my stove back. It still looks better than when I started! I have a ceramic cook top 🙂 So I am a big cheater! But it sure looks pretty now. That is a great trick! I can vouch wholeheartedly that your ammonia trick works on the burner covers. It just melts the crud off. 🙂 I love press n seal! So much better than the other stuff. I’ll have to try this too. I needed the reminder. My burners need cleaning. Thanks! The grease stains from your original burner post, look a lot like the grease stains that accumulate on the bottom of some of my non stick cookware, any chance you’ve tried to clean the bottom of these type if items with ammonia before as well? Is it safe to use on stainless steel stove top?